Liverpool is today mourning the loss of one its most famous and popular lawyers. Graeme ‘Paddy’ Bryson died yesterday aged 99 years and 8 months. I spoke to Paddy only a couple of weeks ago when he came to my President’s Social evening at Everton FC. He stayed until about 9.30 and wrote me a note the next day in which he apologised for leaving early saying ‘my constitution is not what it was!’ I commented at the time that I would be delighted if I had a fraction of his constitution at 99!! One of my first tasks on becoming President of Liverpool Law Society was to attend the ceremony at Liverpool University when he was given an Honorary Doctorate in Law. Paddy himself was President in 1971 – the year I did my O Levels. After a tribute from the University Orator he took to the microphone to say that he was formally requesting that a copy of the tribute be made available to St Peter – ‘as I will be meeting him soon and that will be an excellent testimonial’. Well that day has finally come and the legal profession has lost one of its great characters. Paddy saw active service in WW2 and then qualified as a solicitor. After a successful career he then became a High Court Registrar – a District Judge in today’s language. Indeed I suspect he was the first real judge I ever appeared before as I was shaking at the knees attending on a consent application in 1978. He was always courteous and understanding. In 1960 he hit the headlines when he became the only judge to be shot at in open court as he dealt with a bankruptcy case. A court official was badly wounded as Paddy wrested the assailant to the ground. With stories like that you can see why he became a legend. In his late 80s he was writing local history books including A Century of Liverpool Lawyers. He will certainly feature Large in any second edition. 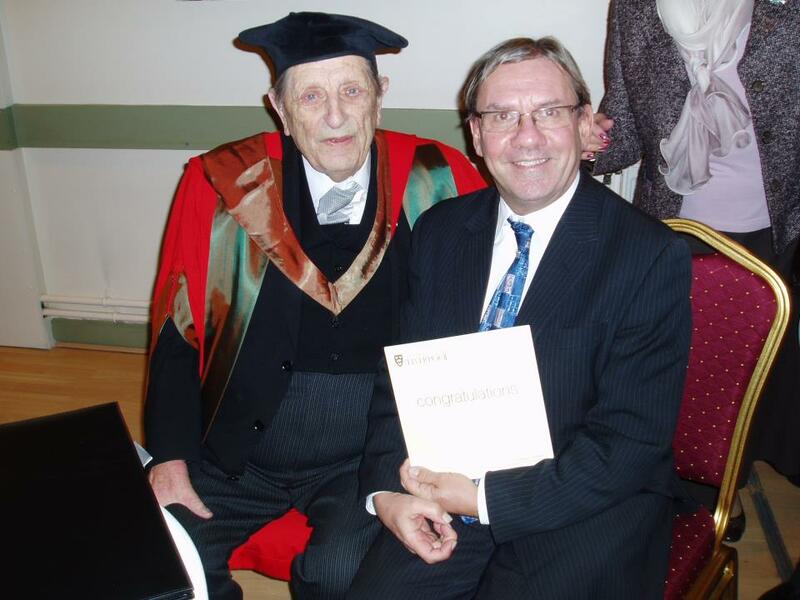 He was a lawyer and judge of the old school – a perfect gentleman who will be sadly missed. Sunday Courts get a Roasting! I have rarely seen the profession so strongly united against a proposal which was being rushed through without any real thought, or even costing. If they have to work Sundays then they would have to require some staff to do the same. Other agencies including the Prison Service, Probation Service, Social Services might also be required to be available. Indeed it seems that the prison service could not give any assurance that those in custody on a Sunday would be dealt with them. So they would end up back in the police station anyway. Relatives would find it difficult to travel to court on a Sunday when public transport is reduced. The scheme depended on solicitors’ volunteering to attend as duty solicitors for anyone arrested on a Saturday. The lawyers unanimously agreed that nobody would volunteer. If one of their own clients were arrested then they would honour their professional obligations to their clients but would not otherwise support a scheme which was, by anyone’s reckoning harebrained! The updated position is summarised in the Law Society’s Gazette in a report where the Virtual Lawyer gets a mention! The scheme has been shelved for now. Hopefully it will now be scrapped altogether. Confession time! I had a remarkably easy ride to qualifying as a solicitor in the early 1980s. I had a student grant and no fees to pay for my Law Degree and Postgraduate course. I went straight from The College of Law into a Training Contract – or Articles as they were back then. On qualification I had a choice of jobs! To Law Students today that sounds like something from Science fiction. For them it is a different world and I feel the need to admit my guilt and apologise – but please don’t put that on a You Tube video! Today’s students face tough competition to get on a course. Then they have to pay £9k a year in fees for starters, plus living expenses. This is funded by eye watering student loans. Most rack up about £50k’s worth by the time they finish. Then, to add insult to injury it is nigh on impossible to get a job. Some find themselves working as paralegals for years in the hope that it might lead to a training contract. Well that is the case for would be solicitors, the situation for young barristers is even worse. There are many who simply drift into a permanent paralegal position and never reach actual qualification. Those who do get training contracts now face the additional problem of the abolition of a minimum salary so they might be paid a pittance after years of hard work and accumulated debt. This could take us back decades to a time when only the rich became lawyers. A legal profession which does not benefit from talent from across society is not representing that society. I suspect that we will see more students qualifying via different routes. There is already talk of introducing competencies which can be reached in different ways. So paralegals and legal executives will be able to achieve the same status as Solicitors and Barristers even if they don’t use the name. The Legal Executive qualification was given a massive boost when the Institute earned its Charter earlier this year. By this route we have ‘lawyers’ who have worked in the real world. When I was let loose on the world in 1980 I was as clueless as could be! So instead of going to study law we could see school leavers beginning what is in effect a legal apprenticeship. It is clear that something has to change. The traditional pathway through academia and exams must surely decline. And the profession could be the stronger for it. John Terry's retirement, does he have a point? The case against Chelsea and former England Captain for alleged racism towards Anton Ferdinand seems to run and run. Today has seen the start of FA disciplinary proceedings against Terry. He is charged with using insulting and/or offensive words towards Ferdinand including a reference to his colour or ethnic origin. If last years' case against Liverpool’s Luis Suarez is anything to go by he could face a long ban if the charges are proved. The case concerns an incident in the Chelsea v QPR game last season when Terry is alleged to have made racist remarks. "It is therefore possible that what he [Mr Terry] said was not intended as an insult, but rather as a challenge to what he believed had been said to him. In those circumstances, there being a doubt, the only verdict the court can record is one of not guilty." So that element of doubt was enough. But in the Disciplinary Tribunal the standard is one of a balance of probabilities. In other words – is it more likely than not? In the confusion of a row between footballers this could well lead to a different finding. Whether it does or not depends on then evidence. But just because he was cleared before a criminal court does not mean that it was not proper for the FA to charge him. The case may run for several days. How to tweet and avoid court! Remember the case of Paul Chambers? He was the tweeter who ended up in court because Robin Hood Airport was closed! He had to fight his way through two appeals before it was accepted that his comment was no more than a harmless joke. More recently there has been the more difficult case of the comments made about diving star Tom Daley. The offending tweet was posted by a football player. It was homophobic and offensive but never intended for a wide audience. It ended up being read by thousands. He has been told that he will not face prosecution because it had never been intended to reach the diver, and he had apologised. Apparently Daley himself had stated that he did not think criminal proceedings were necessary. So it is all very confusing. You might be dragged into court for saying you will blow up an airport but not for sending an offensive, homophobic tweet. The Director of Prosecutions has now announced that he is to issue guidelines about what might or might not lead to criminal proceedings. Kier Starmer has acknowledged that there are millions of posts each day and that communication is almost instant. There are to be interim guidelines followed by a full consultation process. This should make things a bit clearer but social networking is so vast it is difficult to see how it can be properly policed. Of course the easiest answer to the problem is to be very careful what you tweet. If you stop and think that this could be read by half the population – whether you mean it to or not – then that can concentrate the mind. Think before you tweet is the best guidance there is. Only Armenia and Azerbaijan have fewer women on the bench! We have to admit that we all have a particular image of judges. This is based on what we see in the media, soap operas and in some cases our own experience. The three words often used are male, pale and stale. There have been many stories over the years which have seemed to support this image. I have referred in a previous blog to some amusing moments such as the time when a judge asked the barristers to explain what Linford Christie’s Lunchbox was! These are serious matters. We want our courts to be in the hands of judges who are in touch with our lives. In fairness much has been done to try and address this, to encourage younger applicants and especially more women and lawyers from ethnic minorities. But according to a new report there is still a long way to go. According to the report which appears in today’s Guardian only Azerbaijan and Armenia have less women judges. The report notes that – ‘Women predominate in places such as Slovenia where they constitute 78% of judges, in Greece where they make up 65% and France where they are 64%.’ The percentage in England and Wales is just 23%. This is more than just embarrassing. Women make up 50% of the population. They make up more than half of new lawyers. A judicial system without representation from women is simply not reflecting our world. And that is before we even start to look at ethnic minority representation. It is only fair to say that we do have a large number of highly capable and understanding judges. But we need more. I wonder it isn’t time for a complete overhaul of our appointments system. Our judges come from the ranks of longstanding lawyers. In Franceit is a career path so new lawyers are trained as judges from the start. We all need to ensure that this is addressed. But I won’t be joining the ranks – I am far too male, pale and stale! The government is continuing in its efforts to remove rights to Employment Protection. The initial plan was simply to remove the right to claim for Unfair Dismissal. This was put forward on the spurious grounds that it would remove red tape and stimulate the economy. Why is the right to a fair dismissal reduced to such cynical language? We are talking here about peoples’ livelihoods. The plans to abolish the right altogether were abandoned but have been replaced by new proposals which are equally disturbing. The idea now is to slash the levels of compensation. If you win a claim for Unfair Dismissal you get damages under two headings. You get a Basic Award to reflect that you were dismissed unfairly. This is normally linked to the number of years of continuous employment. Then you get a compensatory award which is mainly for loss of earnings. The present cap for compensatory award is £73k. Under the new rules this will be reduced to just £26k or a years pay whichever is lower. So if you are on £12k a year that is all you get. If you are on £60k a year you get £26k. It does not take a genius to see that some unscrupulous employers will do the sums and decide to sack for no reason and pay the lower amount. This is on top of existing plans to make claimants pay fees to Tribunals. It could cost well over £1k to take a case to a Hearing. This is a double whammy. It will deter many workers from pursuing claims. They have just lost their job so they are hardly going to be in a position to shell out that sort of money. And it will be an incentive for employers to fight all cases in the knowledge that many sacked workers will lose heart as the bills are racked up. All of this seems to be designed to make it increasingly difficult if not impossible to bring a dismissal claim. Taking away the rights of people to protect their rights is the same as removing those very rights. Yesterday saw the publication of the report from the Hillsborough Independent Panel and the remarkable statement from the Prime Minister apologising to all of the those who had been affected by the Hillsborough disaster and then been the victims of a shameless attempt by the authorities to blame them. As the day went on and the dust began to settle we were able to see the full implications of the cover up. Not only did the South Yorkshire Police feed the press with inaccurate stories which resulted in the infamous Sun headline, they actually trawled through criminal records looking for material with which to smear the victims – even children. It seems that blood alcohol levels were also checked to try and support an argument that fans had been drunk. All of this was way beyond what many of us expected, and there was a sense of shock throughout most of yesterday. Now in the slightly colder light of day, what happens next? I think that some criminal action is inevitable after such extensive and damaging behaviour from those we should be able to trust. But I still think that a fresh Inquest has to come first. We need to get answers to the questions that were not asked at the original inquest. In particular we need to know how many of the 41 who were still alive at 3.15 would have survived if more ambulances had been on the pitch and sooner. In short we need to get all the facts. Then we will know exactly what was covered up. So I hope the Attorney General makes this decision quickly. Once we know what was covered up when can then take action against those responsible. A large number of civil actions were brought and settled in the early 1990s. The basis on which they were settled is now in doubt so we could see a cohort of new cases brought against the police and others. But whatever happens now, it must be done quickly and thoroughly. The families and victims have suffered enough. As a Society we owe it to them to bring them justice and accountability as soon as possible. Hillsborough - the beginning of the truth.. There can only be one subject for today. This is a piece I have done for www.thejusticegap.com. Most people in Liverpool can tell you what they were doing on 15th April 1989. At 3.00 I was listening to local radio following Everton FC’s FA Cup semi-final with Norwich City. I knew that Liverpool FC were just getting started at Hillsborough in the other semi against Nottingham Forest. Ten minutes later everything changed and the football games became irrelevant. Twenty three years later we have finally moved towards the truth of what happened. I can still remember the news coming over the radio that there was ‘trouble’ at Hillsborough. The initial reports also said that the trouble seemed to have been caused by Liverpool fans. That has been a factor in the perception of the tragedy ever since. Particularly with the Sun Newspaper’s disgraceful headline – ‘The Truth’ which laid the blame firmly with the fans. "All those people responsible for staging that match, from the Football Association... to the police policing it, the emergency services who attended it... The simple answer for everybody was: blame the fans. They killed themselves. Well I'm afraid that doesn't work, it doesn't ride, it's not true. I think what we want is the truth." It seems that we are now much closer to the truth following the release today of the devastating report from the team led by the Bishop of Liverpool who have reviewed all available documents including many which had not previously been disclosed. This is not an inquiry which can apportion responsibility. It is simply a report on the documents which, frankly, tell their own story. Following the disaster there was an inquest in Sheffield. The Coroner found that all of those who died had lost their lives by 3.15pm. That finding has always been controversial and has underpinned all subsequent discussions and reports. It has now been shown to have been completely wrong. There is evidence from the documents disclosed showing that a significant number of victims were still alive after 3.15 and could possible have survived if there had been a quicker and more efficient response. In fact it seems that the number could have been as high as 41. This takes the investigations to a different level. In a statement to the House of Commons the Prime Minister David Cameron acknowledged the double injustice suffered by the relatives of victims. He talked of a - "failure of the state to protect their loved ones and the indefensible wait to get to the truth", and in the efforts to denigrate the deceased and suggest that they were "somehow at fault for their own deaths". He offered an unconditional apology to the families on behalf of the nation. Most significantly he emphasised that the fans were not in any way responsible. So the way is now cleared to enable us to get to the truth. There must surely be a fresh inquest. The report will be reviewed by the Attorney General who will need to apply to have the original inquest quashed. There will then be a fresh hearing hopefully before a senior judge sitting as a coroner. This is an essential first step. We can then finally get to the bottom of why it has taken 23 years to get where we are today and why it has taken the resilience of the families to fight and fight to get to the truth. Only then will we see true justice for the 96. In a surprising move the government has announced a change of heart over cuts to compensation payments for victims of crime. A few months ago it was announced that the Criminal Injuries Compensation Scheme was to be severely cut back and that payments were to be limited to only those suffering more serious injuries. This was likely to leave victims of significant injuries without any compensation. This would deprive them of a right to state payments which has existed for decades. The planes were announced by the, now departed, Justice Secretary Ken Clarke. They were even defended last week by new junior minister Helen Clarke who announced that the scheme had to focus on those ‘most seriously affected’ by the injuries. It is also encouraging to see politicians responding to criticism and lobbying. There cannot be many who were not inspired by the remarkable performances of all who took part in the Paralympics which came to an end last night. Bearing in mind the astonishing hurdles which they all had to overcome, their achievements far outweigh those of the mainstream Olympians who went before. They have been an inspiration to us all regardless of which nation they represented or which medals they did or didn’t win. What the games have also done is emphasise the massive contradiction between the achievements of people with disabilities and the major struggles that they have to face in our country. I attended a meeting in Liverpool last week with a group of representatives who advise those who have been deprived of disability benefits following medical assessments which say that they are fit for work. They talked of the tens of thousands of appeals against ATOS decisions. They also confirmed the alarming statistic that about 80% of the appeals succeed where the claimant is represented. That is bad enough. But to add insult to injury the entitlement to Legal Aid will be withdrawn for all of these cases in April 2013. This means that these organizations will no longer be able to appear for those most in need. I hope that the achievements of the Paralympics heroes will highlight these injustices. These are people who have to live from day to day facing difficulties which the rest of us cannot imagine. Why should they then have to battle to retain benefits to help them get by? And then on top of that they have to fight those battles without access to professional advice and support. Do we really need to have a discussion about whether or not this is wrong? Apple Inc. have been no strangers to litigation in recent weeks. They succeeded in a high profile action in California against Samsung who were ordered to pay them just over $1b for copyright infringements. The allegations related to claims about the shape of recent Samsung Smartphone’s and other features such as certain touch controls. Apple have failed in similar claims in Britain, South Korea and, most recently, Japan. This is obviously a good time be a lawyer working for Apple. I should say that as a Samsung Galaxy convert from iPhone I hope that they continue develop what is, in my opinion, a superior product. But there is one piece of reported litigation that was sadly, not true. But is does raise an alarming issue which I hadn’t thought of before. I should confess to possessing a similarly vast collection on iTunes running to several thousand tracks. Many of these are ones that I have bought from iTunes or Amazon. I have been through the ages of vinyl, CDs and have ended up with download – although the absence of interesting artwork and packaging is beginning to make vinyl attractive again! But I owned my old albums and CDs. It seems that I don’t actually own my downloads. What I am buying is not the song itself but the right to play it on iTunes, iPod or whatever. So I could not leave them to my sons in my will – not sure that they would want a lot of them! But it is still an alarming thought. It is in the Apple Terms – you know the pages of stuff that none of us ever read. It seems that is also in the Amazon terms as well so they have me all ways. I might be tempted to spend less money and more time on Spotify . Just a thought! Clarke and Djanogly Out ... what next? The recent Cabinet re-shuffle has seen the removal of Ken Clarke as Justice Secretary and Jonathan Djanogly as Justice Minister. They have been the architects of the Legal Aid Sentencing and Punishment of Offenders Act (LASPO) which has seen the most brutal cuts in Legal Aid in history, alongside relentless attacks on personal injury victims and their lawyers. So for anybody concerned with Access to Justice this could be good news. But I would not be celebrating just yet. Mr. Grayling is certainly not on record as opposing any of these cuts and since LASPO has now received Royal Assent an ambitious politician is unlikely to change much. In the past he has spoken out against The Human Rights Act but Liberty has pointed out that he did oppose ID cards and quoted the Human Rights Act. And he may have a different view on the secret courts which I have mentioned before. On the other hand he did also once speak in favour of the rights of Bed and Breakfast owners to turn away a gay couple. The general view in the medial is that the main purpose of this re-shuffle is to placate the Conservative Party’s right wing. If that is the case we should not expect too much to change in relation to Legal Aid, Human Rights or open justice. On the other hand this is a complete clean out of the old regime that has angered most lawyers and others involved in advising ordinary people. So maybe there is some scope for a more sympathetic approach. An exhibition has been launched this week in Burnley, Lancashire to commemorate the Hapton Valley Mining disaster which happened 50 years ago in March 1962. "There was a terrible blast and we were all blown 10 or 15 yards along the face", said Mr. Jack Murray, aged 36, of Jockey Street, Burnley, senior man of the 90 fillers who were shovelling coal on their hands and knees. Other workers were close behind when the explosion happened at 9:45a.m. "The next thing I knew was that I couldn't see a thing because of the thickness of coal dust in the air", said Mr. Murray, who suffered burns on his arms. "Some of the other 170 men working in the pit at the time were on the spot almost immediately with stretchers to carry out the wounded." But the truth is that thousands of workers can now leave home and not have to fear for their lives. The workplace is a healthier and safer place. Whilst there will always be incidents – often caused by cutting corners to save costs – there can be no doubting that Health and Safety have saved thousands from death or injury. So as we remember those who perished in Hapton Valley 50 years ago we should not forget the changes from which we have all benefitted since then and do all we can to maintain a culture that ensures that people can do their jobs in safety and security. I posted a blog, a few weeks ago, about the growth in comparison web sites, and my own dedication to Trip Adviser. I talked about the Law Society’s proposed site to menable clients to rate their lawyers. We are now hearing about the ultimate in legal ratings – The Super Lawyers!! According to Legal futures this is an idea imported from the USA. It seems to be focussed on lawyers rather than law firms. And the emphasis is very much on high end commercial law. The pilot of the UK scheme is going to be in London. Now we all like to think of ourselves as the next generation of super heroes. But to qualify as a Super Lawyer we will have to be based in London, nominated by another lawyer and do a particular type of work. So if you are looking for a good lawyer to do you house purchase or accident claim then this may not be for you. If you are looking for someone to do your million pound company take-over then it may be worth a try. So where should you look for a good lawyer? I have mentioned Solicitors-Info last time and that is useful reference point. Otherwise it is back to the good old recommendation from friends and family who have used the firm before. It brings us back to the need for a full blown, ratings site; a sort of Brief Adviser! And hopefully this will see the light of day, sooner rather than later. These developments are good news for consumers. There was a time when lawyers expected work to come thought the door because that was the way it had been. Some acted for generations of the same family. The modern lawyers will see clients return because they done a quality job. If they don’t clients will just Google another! Comparison sites will ensure an even greater focus on quality to ensure and maintain a good rating. Will sign off there as it is tiring having to do a day job when you are up all night being a super hero!